​delivery incurs a 10% surcharge and is by arrangement only. No design or artwork? If you need your flyers designing we will do it for just £15. 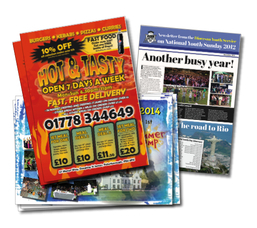 ​A basic design to your specification and you'll get to see it and suggest corrections before we go to print. Get a basic artwork design for your A5 or A4flyers. Please note: These are our payment with order web prices, payment on delivery incurs a 10% surcharge and is by arrangement only. No design or artwork? If you need your flyers designing we will do it for just £24.